PC-1 VTOL quadcopter is manufactured by Ukrspecsystems, a company based in Ukraine. PC-1 quadcopter seen during the Arms and Security 2016 international exhibition held in Kiev, Ukraine. 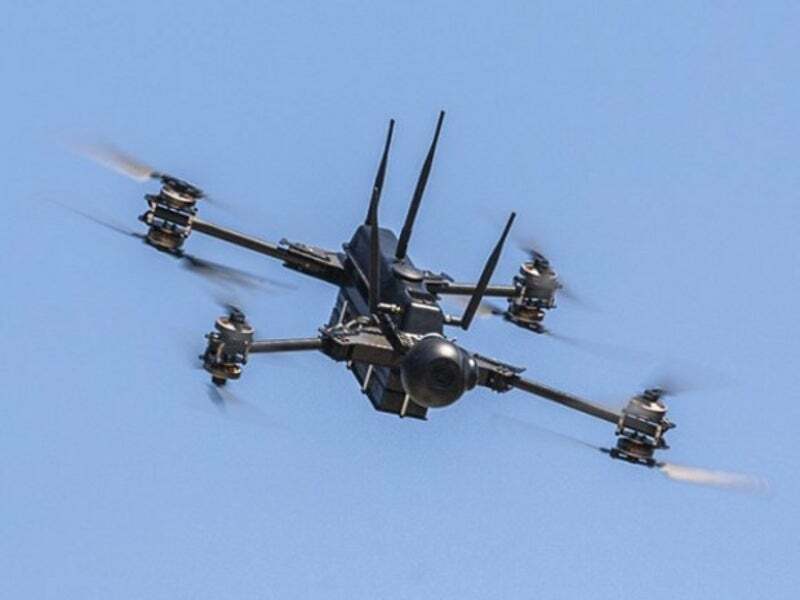 PC-1 lightweight, vertical take-off and landing (VTOL) multi-rotor helicopter is currently operational with the Armed Forces of Ukraine, and manufactured by Ukrainian drone maker, Ukrspecsystems. Capable of carrying a variety of payloads, the quadcopter can be used for a wide range of military and tactical missions, including intelligence, surveillance, reconnaissance, detection and tracking of ground targets, and search-and-rescue. In addition to military operations, the unmanned helicopter can be used for special forces missions such as emergency response, inspection and monitoring. The drone has the ability to conduct missions in complex urban environments. The PC-1 unmanned air vehicle took part in the recent AUVSI XPONENTIAL held in Dallas, Texas, US, in May. The PC-1 quadcopter system comprises an unmanned rotorcraft, autopilot, ground control unit and payloads. Carbon fibre composites are used in the construction of the rotorcraft that employs a coaxial rotor configuration with four rotors. The quadcopter features compact airframe, which can fold up into a backpack. It has a length of 530mm, width of 480mm, height of 130mm, and maximum take-off weight of 5.6kg. The drone’s VTOL capability allows it to take-off and land vertically, while the maximum set up time of the PC-1 is two minutes. A fully programmable flight controller is installed to enable fully autonomous flights from take-off to landing using pre-defined waypoints. The mission plan can be modified by the operator during the flight to provide operational flexibility. The PC-1 quadcopter is fitted with a gyro-stabilised gimbal mount to house a variety of electro-optic (EO) / infrared (IR) imaging sensors to meet the mission requirements. A USG-252 gimbal comprising 10X optical zoom full high-definition camera and a high-performance thermal camera can be fitted to capture imagery and video for surveillance, target tracking, and search-and-rescue operations in all weather conditions, both during the day and at night. Other payload options include USG-251 gimbal with 10X optical zoom high-definition camera, USG-251IR thermal camera, and GoPro gimbal. The drone provides the operator with the ability to quickly interchange payloads. The drone can be remotely controlled by its operator using a ground control station (GCS), which runs on a Windows 10 operating system. Equipped with high-definition (HD) touch screen, the GCS allows the operator to control the quadcopter, set flight path, and manage payloads during the flight. A digital encrypted telemetry link is used to transmit imagery and telemetry data captured by the rotorcraft’s payloads to the GCS within a distance of up to 5km. Real-time video from the drone is transmitted to the ground segment through an optionally encrypted digital video link. The battery-powered ground control system can operate continuously for up to four hours. The PC-1 unmanned multi-rotor helicopter is powered by eight coaxial brushless motors using replaceable batteries. Each motor drives a two-blade propeller fitted to the end of the arm. The drone has a service ceiling of 1km and is capable of staying airborne for up to 38 minutes. It can withstand wind speeds of 20m/s and its multirotor design offers enhanced reliability under all weather conditions. ShadowAir LTD, based in Boulder, Colorado, US, is a provider of manned, unmanned and optionally-piloted dual-mode Airborne ISR Solutions and Mobile Communications Platforms.